The Creaky Knees Guide Arizona is a hiking guidebook filled with kinder, gentler trails. Created for anyone who--regardless of age--can't or doesn't want to hike great distances over rough terrain to gain beautiful vistas and enjoy the wilderness. Here are 80 of the best easy-to-walk hikes throughout the state. Most are day hikes, but there are a handful of backpack trips worthy of the Creaky Knees stamp of approval. Trails are divided into regions: Grand Canyon, Northeast Plateaus, San Francisco Peaks Area, Mogollon Rim Country, Central Highlands, White Mountains, Phoenix Area, Tucson Area, Southern Mountains, and Western Deserts. Elevation gains, including a topographical map. Mileage and estimated hiking time, trail conditions, effort level, best season, map references, exploring options, access, permits required, and where to find more information. Further directions to offshoot hikes, if you reach the end of the hike, but want to extend your workout. A chart at the front of the book compiles the hikes per effort level required, overall hike rating, and best season(s) to hit the trails. 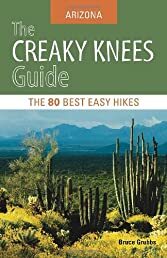 Written in a personal but informative tone by outdoors expert Bruce Grubbs, this Creaky Knees guidebook is a perfect resource anyone can use to explore the beauty of Arizona, without breaking too much of a sweat.